Everyday, more people are browsing the internet through their mobile devices. According to the Pew Research Center, 57% of American adults own a smartphone, and 60% of them use it to access the web. 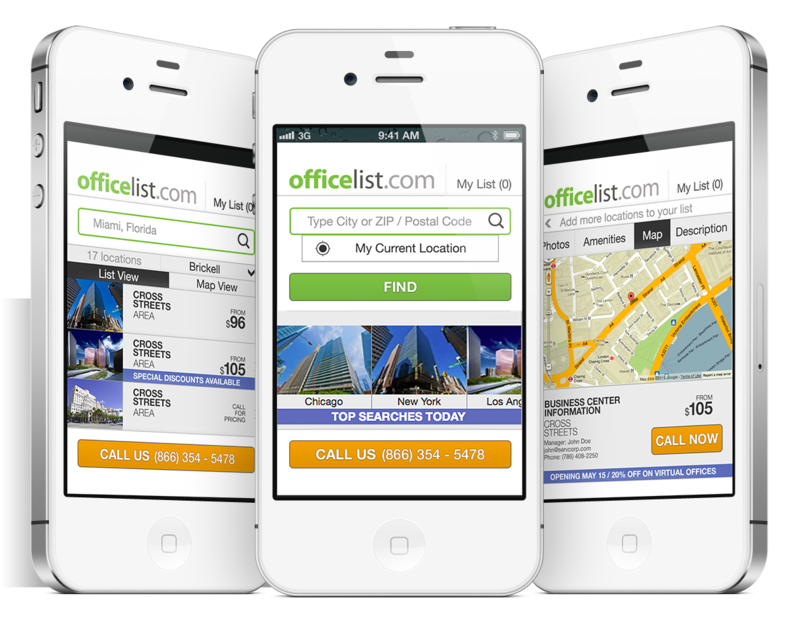 OfficeList is proud to announce the launch of our mobile site, a new tool for all the people looking for office space from their mobile devices. For several months, we worked along a great team of developers and web designers to produce the finest product possible, ready to suit your office search needs. Find the closest location to you using our 'Current Location' feature. Access all the offices you've selected through 'My List'. Easy-to-use interface, with clear buttons, large fonts and high quality photos. Responsive design, our mobile site adapts to all your devices. To access our mobile site, go to m.officelist.com and start browsing, no need to download apps or buy anything, just access the new site every time you browse from your mobile. You can then add us to your favorites so you can easily find us. We want to learn from you, please call us at 866-354-5478 and share your feedback with us so we can improve your office search experience.